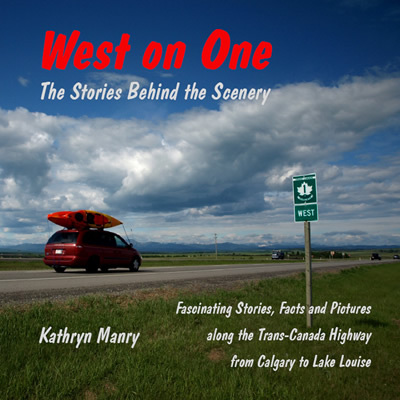 pulls together diverse stories and information and presents them in the same manner as the traveller encounters them – en route, along the Trans-Canada Highway. The book tells the stories of early exploration of the west, the first ranches and homesteaders, industrial developments that are obvious in the landscape but mysterious in their activities, communities with deep roots in provincial history, a native reserve with a rich history and culture of its own, some basic geology as the Rocky Mountains rise on the horizon, the wealth of animal life that lucky travellers may glimpse along the highway and the formation of a park that brings pleasure to many visitors each year. It is a useful and engaging work, which brings alive the past and present along the 183 kilometres between Calgary and Lake Louise. West on One is a guidebook, a fascinating account of history and a wealth of information.